Awesome designs! Keep them coming! Whoa, there are some nice ones there. 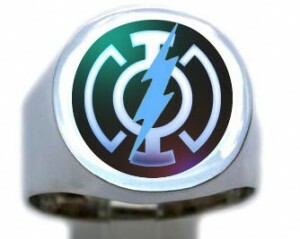 However, being a fan of the Blue Lantern Corps, my favorite would probably have to be the first one. Can I vote for the one that opens? Very cool. Hey guys good work ! Nice rings designs. I hope Aaron Rivin’s design wins. The only reason I haven’t bought a ring from Arroba Silver is that I’ve been hoping they would add a wearable replica of the costume ring. I like the last one,joey. I really like the ring of Joey Forlini. Nice artwork and should be easy to buy in stores. Thank you to everyone that likes my design! 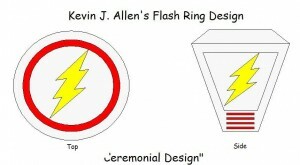 nice ring designs everyone! Especially like Joey’s ring, really sweet! 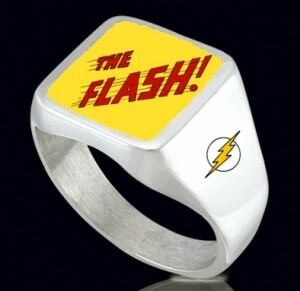 i think Joey’s ring represents well the flash! I can back up my claim beacuse I still have my original prototype to this ring and thus can easily provide more photos of it, whereas I suspect Mr. Riven would only be able to provide the three images posted by Ted. 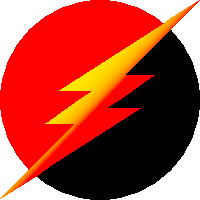 I am furious that this had happened because I intended to seek a license from DC Comics to produce and sell my Flash and Green Lantern ring designs in the future. That’s why I refrain from entering a contest like this because, according to the contest rules, all designs entered would become owned by Arroba Silver. I am hoping this would not be the case with my stolen design, since it is not a legitimate entry. My lawyer and I will be discussing options this week. I am so sorry this happened. We will definitely NOT be forwarding that entry to Arroba Silver, so there should be no risk to your design. Please let us know if there is any further action you would like us to take. I did this spotlight now. Otherwise all the entries would have been headed to the Arroba Silver. Thank you for speaking up and letting us know. Great job Joey, yours pwns mine. When are you gonna announce the winner?? We’re still waiting to find out ourselves. Oh my god! I’m SOOO Sorry!!!!!! I didn’t realize it had to be your own artwork!! I submitted several images that were from comic panels as well!! I never meant to insinuate it was my own work! I in no way intended to steal your artwork! What part of “design your own” didn’t you understand?